Eating the Ersatz Moroccan Chicken, which I concocted a few weeks ago, triggered a memory of one of my best-loved childhood meals, my mother’s Chicken with Lemon Gravy. It was my favorite comfort food (a term which admittedly was non-existent 60 years ago). Not only was the chicken juicy and tender, even the breast meat, but the skin was crispy and delicious. The lemon gravy was redolent of oregano and garlic; and, as a reward if I ate all of my chicken, I could pour some of the extra gravy onto my plate and sop it up with Italian bread. 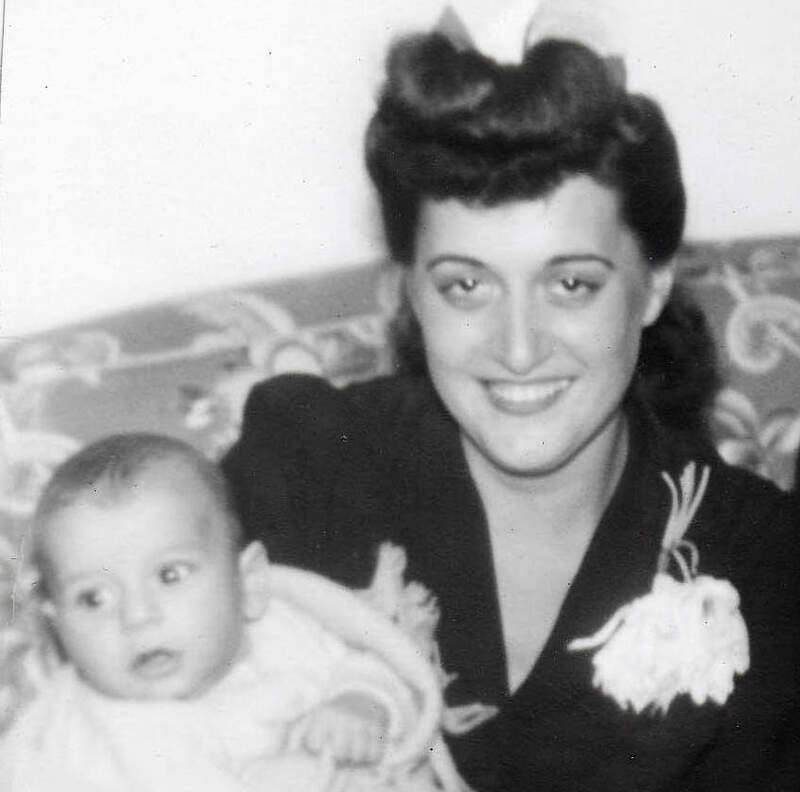 So last night in memory of mom, I cooked up a batch of her Chicken with Lemon Gravy and after eating all of my portion, 1/2 of a split-breast and a thigh, I sopped up the extra gravy with several chunks of Italian bread. It was a great trip down memory lane and I felt very comforted. With a nod toward more contemporary cuisine, the chicken was accompanied by Grilled Summer Vegetables and roasted sweet potato slices drizzled with balsamic glaze; the latter, an idea introduced to us by a friend. 1/3 cup thinly sliced garlic, about 16 cloves. 1. Sprinkle both sides of each chicken piece with salt and pepper to taste. 2. Whisk together the lemon juice, olive oil, water, oregano and garlic to make a marinade. 3. Place chicken skin side down in a non-reactive pan and add marinade. 4. Marinate 1 hour at room temperature turning once after 30 minutes. If you have the time, marinate overnight in the refrigerator and turn pieces periodically. 5. Position oven rack about 6 inches below broiler element, remove chicken from marinade, place skin side up on a broiler pan and baste before placing under heat. 6. Add marinade to a small pot and bring to a boil. Let simmer while chicken is broiling. 7. 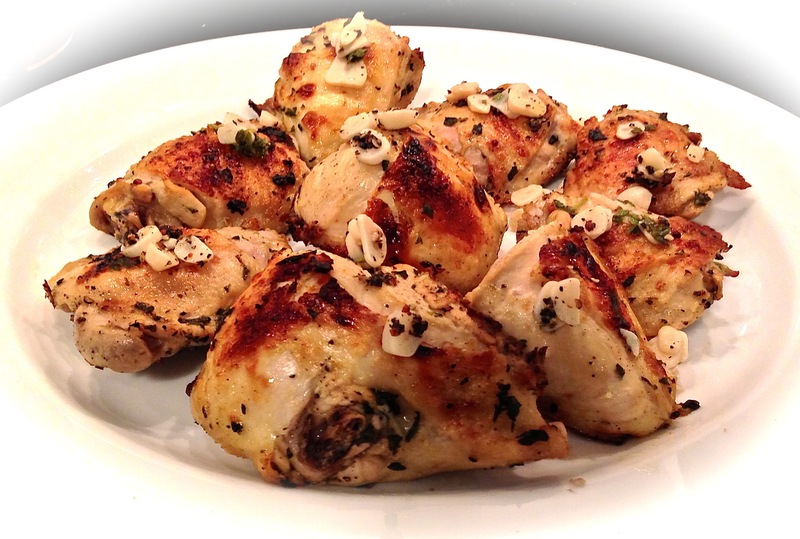 Broil chicken for about 22 minutes, basting frequently with the marinade. Turn pieces and broil 22 minutes more, basting frequently. 8. Raise rack one level, turn chicken pieces skin side up, baste with marinade and broil for about 4 minutes to crisp the skin. 9. When chicken is done, remove to a plate and keep warm. 10. Add pan juices to the boiled marinade, skim the fat and serve with chicken. *Note: This recipe provided a main course for two, with enough leftovers for another meal. The jar of Preserved Lemons was hanging around in the pantry for several years and would soon reach its expiration date. The pantry also contained a box of Trader Joe’s Couscous, as well as a jar of Zatar, the latter thanks to a Penzey’s gift certificate from my daughter. A quick perusal of the freezer revealed four chicken legs, both thighs and drumsticks; so it seemed to me that I had the basics for a Moroccan dinner. While I had eaten a chicken tagine on more than one occasion in New York, which pretty much has a restaurant for every type of ethnic food, I had never prepared a Moroccan meal. As luck would have it, the pantry also disclosed a jar of Harissa Spices, compliments of Williams-Sonoma and the refrigerator gave up a jar of Kalamata olives, as well as some green olives, albeit with pits. Good enough for me to give it a go. Improvising as I went along, I browned the chicken pieces in olive oil, tossed in Zatar, then Harissa, added a dash of powdered ginger on a whim, deglazed the pan with the preserved lemon liquid, then added the preserved lemons and olives, covered the pan and cooked the concoction for 10 minutes. In the meantime, following Trader Joe’s directions, I made a batch of couscous. When the chicken was done and I tasted the sauce, I knew I had a winner! There were no leftovers worth worrying about, and whether it was real or ersatz Moroccan, neither I nor my wife gave a fig. 1. In a sauté pan with a cover, and large enough to comfortably hold the chicken, heat the olive oil on medium, then add the chicken pieces. Reduce the heat to medium – low and brown the chicken for 20 minutes, turning frequently, about every 3 or 4 minutes. After the first complete turn slowly sprinkle the Zatar all over the chicken and after the second complete turn do the same with the Harissa Spices. Then sprinkle the powdered ginger all over the chicken. 2. After 20 minutes remove the chicken, add the liquid from the preserved lemon jar, but not the lemons, and de-glaze the pan. 3. Add back the chicken, toss in the lemon and olives, raise heat to medium, cover and cook for 10 minutes turning the pieces once or twice to make sure they are well coated. 4. In the meantime cook the couscous according to the directions on the box. 5. 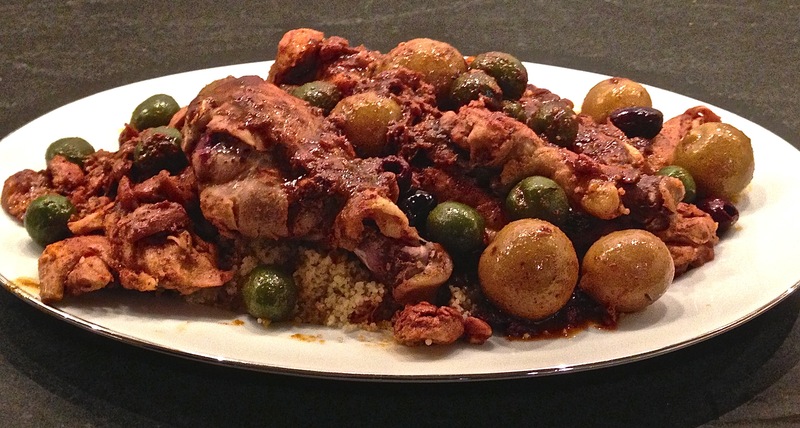 When the chicken is done, transfer the cooked couscous to a serving platter, remove the chicken and place over the couscous. Raise the heat to thicken the sauce, then pour it over the chicken and couscous. Serve immediately.